South London Women Artists - Julie Bennett, "Do you still love the world?" Julie Bennett, "Do you still love the world?" I left Dulwich-born Julie Bennett’s studio with the feeling that every dream can come true: I don’t know if it’s just because her’s actually did, or because of her overwhelming and contagious enthusiasm. 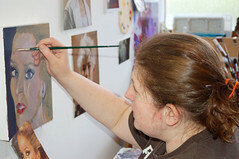 With her hair up, jeans and t-shirt studded with colourful paint, Julie is the queen of her small and cosy studio.The walls are decorated with some of her favourite paintings, two self-portaits, one of herself as the Mona Lisa. Influenced by artists such as Michael Andrews, Lucian Freud, Marlene Dumas, Jenny Saville, Julie is fascinated by people’s faces and inspired by religious iconography, popular culture, graffiti, tattoos. Despite her success - she has been labelled one of Saatchi’s new stars by The Independent in November 2006 - Julie started painting relatively recently, beginning only two years ago. 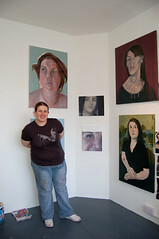 After completing an eight-week summer school in painting in UCL Slade School of Fine Art in 2006 and a HNC BTEC in Fine Art at Kensington and Chelsea College in 2007, she is now studying at Chelsea College of Art and Design. “I have worked in graphic design for ten years, for famous magazines such as Q, Classic Rock, Metal Hammer, and I realized that I was using my hand only to move the mouse. When I felt I had achieved everything I wanted to achieve from a career in graphic design, I thought I needed to do something new, and what did I do? I enrolled in a course to play guitar: I was absolutely awful! It was a struggle to play, I couldn’t even see myself writing music. I’ve played guitar for two years, it was just dreadful! Then I enrolled in a painting course and that was an epiphany, it really changed my life. I started for fun and I’m so excited by the turn my life is taking”. http://www.juliebennett.co.uk/ Julie works in William Angel Studios, Peckham, with two sculptors, a photographer and an interior designer; their next group show is in April 2008. Meanwhile, her paintings will also be exhibited from March at the Sassoon Gallery, in Peckham, London SE15 and The Saatchi Online Gallery are representing two of her paintings at FORM London art fair.